Should I write that down or try to type it in on my iPad Mini? Do you ever have those thoughts run through your head in the midst of a meeting or class? I do. It’s a first world quandary. Fortunately, there’s a stylish chunk of leather that will house both paper and electronic tablet for you. Enter the Shinola Journal Cover for iPad Mini. This is the second piece we’ve reviewed for Shinola. The first being their beautiful Envelope for iPad Mini. https://bestleather.org/shinola-envelope-for-ipad-mini-review-145/ Shinola is becoming a powerhouse brand, gaining momentum all of the time as a top notch, high-end design and crafting firm based in the USA. Everything they make is proudly made here. As with Shinola’s other fine leather goods, the Journal Cover for iPad Mini is crafted in St. Genevieve, Missouri. 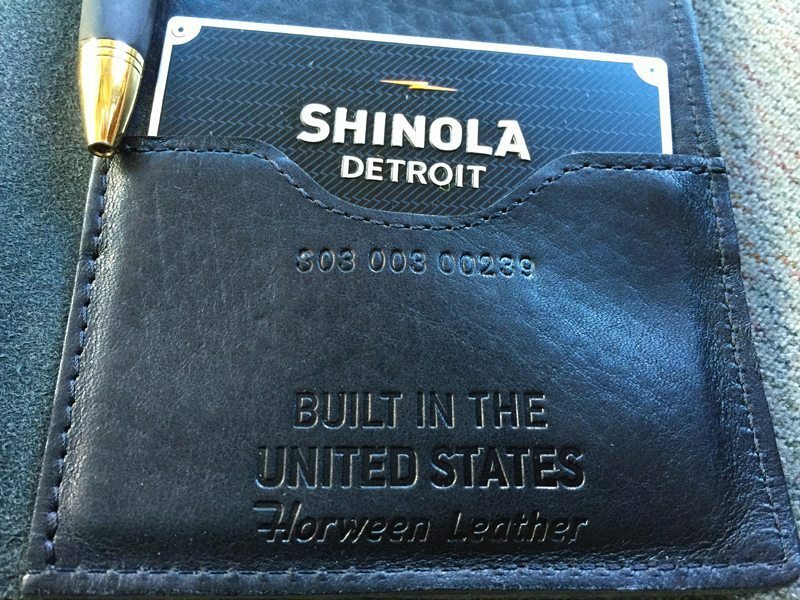 The premium leather is sourced from Horween of Chicago, IL. My Journal Cover is black with black thread. It’s expertly cut and stitched together. In fact, Eric Scott built it. I know this because of the impressive metal card included with my Journal that has his name stamped in the “Built By” section. The Journal Cover for iPad Mini exudes luxury. The leather is soft and supple to the touch. It’s thick and protective of my iPad Mini, but it’s not bulky in the least. When I first received the Journal Cover, I only used it to contain my iPad Mini and some business cards. Without a paper journal in it I found the cover to be too floppy and kind of a nuisance to handle. So, I ordered a set of Shinola’s Medium Paper Journals. Once I had one of their 72 page premium journals in there, the Journal Cover suddenly became the perfect meeting companion. I now carry it all of the time. If you want, you can probably insert your favorite type of journal in there without issue (i.e. Rhodia, Moleskine, or others of similar size). The only thing that’s glaringly absent is a pen or pencil slot. I wish this was integrated into the design, but at least there is space to secure a writing utensil within the cover. The Shinola Journal for iPad Mini is available in 14 different leather colors. And, you can order their very useful journals in 8 colors. 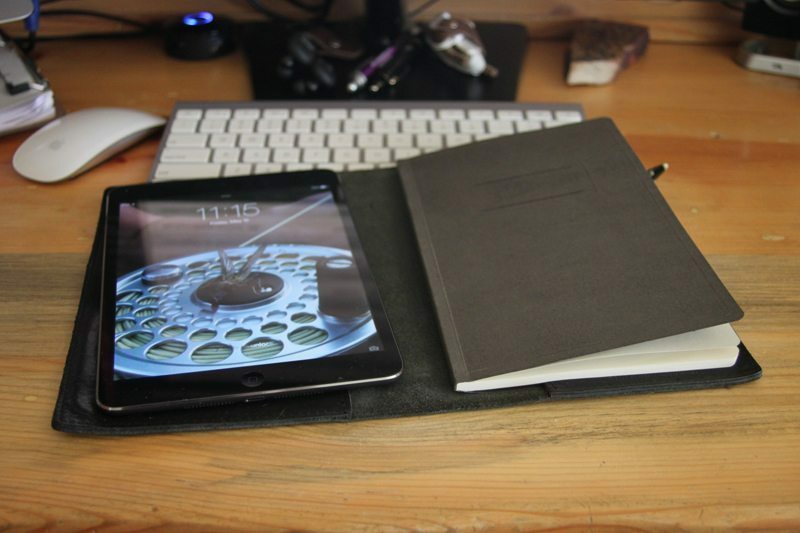 The black leather of my Journal Cover, combined with the grey journal and my Space Gray iPad Mini combine for a trifecta of visual awesomeness. It looks good…really good. And, it generates comments. Also, people want to touch it and hold it. I don’t mind. If you are like me and need/desire/want to have the ability to jump on the Internet, check your email, or perform other functions in our technology laden world, but still yearn for the ability to write things down, and you want to keep it all organized and looking good, consider getting yourself a Shinola Journal Cover. 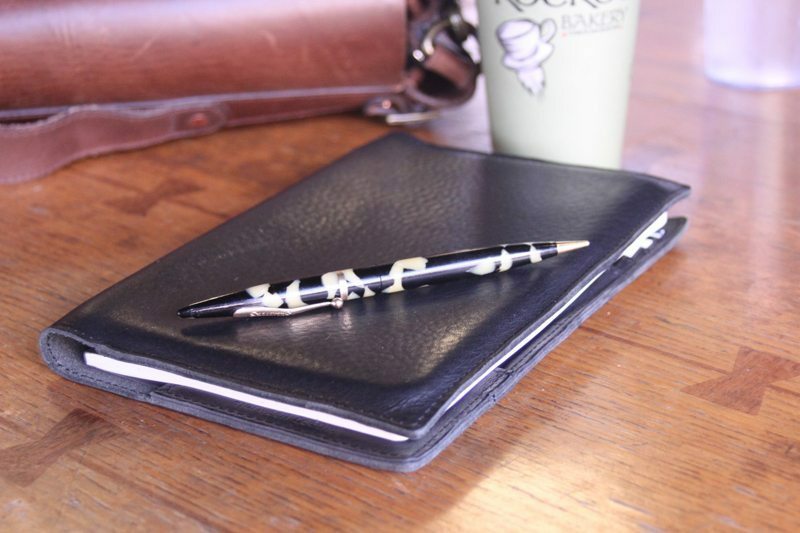 At $150, it’s a great way to protect your technology, keep your business cards at hand, and still have a spot to keep good old fashioned notes written down. 1 Comment on "Shinola Journal Cover for iPad Mini Review – $150"